Mayor John van Keuren and members of the Glen Rock Volunteer ﻿﻿Ambulance Corps (GRVAC﻿﻿) surprised GRVAC President Diane Herrlett last night when prior to the monthly GRVAC drill, members drove the rigs over to Borough Hall where the Mayor was waiting to unveil bricks in between two holly trees that were planted in appreciation of Diane and Paul Herrlett. 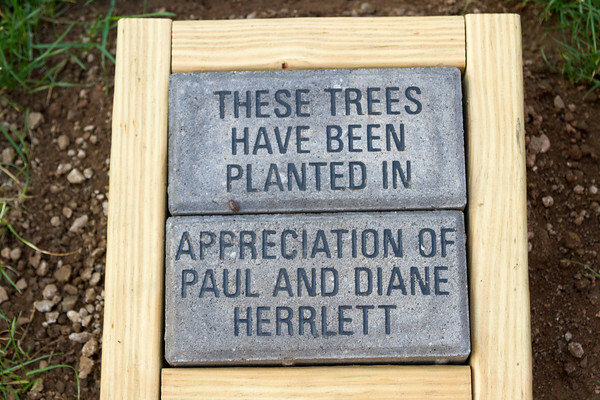 The Herrlett's volunteered many years in Glen Rock. Diane is the current GRVAC President and a member for more than 30 years. 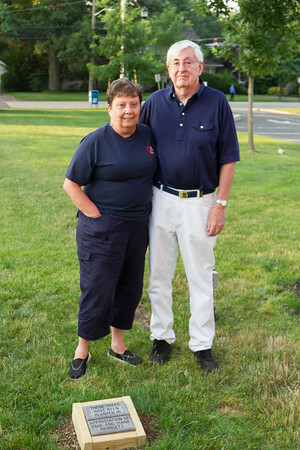 She is also a member of the Glen Rock Zoning Board as well as the Historical Society. Diane's husband, Paul, passed away in November 2010. He ﻿﻿﻿served as GRVAC president and also a member for 30 years. Paul was chairperson ﻿﻿﻿of the Glen Rock Board of Health and employed by the Borough as the shuttle bus driver during his semi-retirement years.